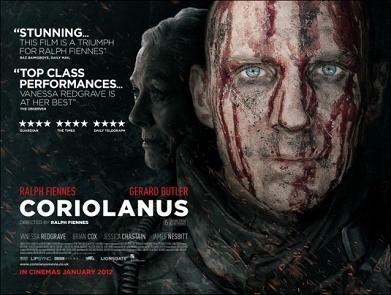 Coriolanus is one of The Bard’s lesser known tragedies, but a great one nonetheless. TS Elliott once said that it is “better than Hamlet.” That’s an incredible statement to make, considering Hamlet is one of the greatest pieces of literature every written, and coming from anyone else, I’d probably just blow them off. But this is coming from a Master of Literature himself and is a little harder to ignore. When TS Elliott says something like that, you kind of have to pay attention to it. So I am. Confession to make here, I’ve never read Coriolanus, in fact I only had very passing knowledge of the play. However I’m glad to I did watch this production. If, you like me, don’t know the story behind Coriolanus, here ya go. Shortly after the explusion of the Tarquin Kings, Rome experiences a riot. The storehouse have been close and the poor have no food. And, like any situation where the haves have and the have nots have not, there is a riot. Caius Martius(Ralph Fiennes), a brillant Roman general, is the subject of their anger, blaming him for the lack of grain. Martius, for his part, has little regard for the poor, looking down on them for their lack of military service. Then there is a war and Caius captures the city of Corioles while clashing with military rival Tullus Aufidius (Gerard Butler). After winning the city, Martius is given the name…wait for it…Coriolanus. Coriolanus then goes back to Rome and at the urging of his mother (Vanessa Redgrave) takes a seat on the Senate. A couple of fellow senators, fearing he will take over and over throw the Senate, arrange for ANOTHER riot with the poor. Coriolanus goes off on them and then is excelled. He then travels to see his rival Aufidius to ask him to kill him. Aufidius says “no, we want to fight with you” after they hug it out. Aufidius and Coriolanus then attack Rome and Coriolanus’ friend, Menenius (Brian Cox), pleads with him not to attack Rome, but fails. Then they ask Coriolanus’ mother, wife (Jessica Chastain) and son. This works and Coriolanus works up a peace treaty. This makes Aufidius mad and he kills Coriolanus. This was the directorial debut for star Ralph Fiennes and it shows at times. He employs the shaky cam element for a lot of the scenes, giving it a herky jerky fluidity that also makes it hard to see what’s going on at times. However the acting is suburb, as you would expect from a cast of this caliber. 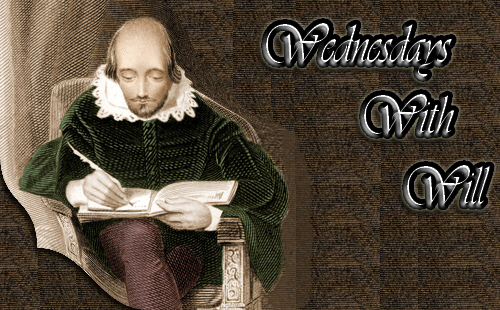 If you prefer “traditional” Elizabethan Shakespeare, you aren’t going to like this. Fiennes, like many others have, chooses to place this in a present day/slightly dystopian setting. I’m not a traditionalist when it comes to interperting Shakespeare so this didn’t bother me, in fact I quite liked it. In fact I felt that it highlighted the struggle we still have today between the haves and the have nots and riots and protests similar to what we see with the Occupy Wall Street movement from the past year. Final recommendation? See this film. I’ll give it a try, Everett. Thanks for the point in the right direction. Thank you for reviewing Coriolanus, Everett. Yesterday, before leaving my office at DISH, I saw online that Coriolanus was available to download to my Hopper DVR. I rented it and it was ready to play when I got home. Unlike Hamlet or King Lear, the story of Coriolanus was unfamiliar to me. The online description didn’t mention Shakespeare so I was a little surprised to her his prose against the war torn, Eastern European backdrop of “Rome”. I realized what I was watching right away and my interest in watching the film increased. 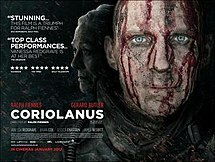 Modernizing Shakespeare can be a tricky task, but I think they did a pretty good job with Coriolanus; I found the movie to be an interesting mix of shoot em up and Shakespearian dialogue.